Compost is the result of the biodegradation of organic matter by various microorganisms such as bacteria and fungi. When added to soil, it improves the soil structure, reducing the potential for compaction and increasing porosity, which promotes drainage in clay soils and augments water retention in sandy loams. It boosts microbiological activity by supplying the microorganisms in the soil with food, which is recycled into plant-available nitrogen, potassium, and phosphorous. This increase in soil fertility stimulates root development and enhances nutrient uptake. In vineyards, the application of compost can minimise variability within a block, increase vine’s resistance to disease, and supress under vine competition. 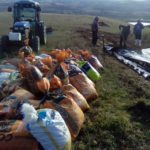 Composting not only provides a valuable end product, it also solves a winery waste management issue by utilising the spent grape skins, stems and seeds, collectively known as marc. At Misha’s Vineyard, composting is an annual project that takes place after harvest, once all the grapes and must have been pressed and the grape marc is returned to the vineyard. In addition to the marc, our compost is comprised of pea straw bailage, dried leaves, sheep and horse manure, and lime stacked in alternating layers, with water added at each step. The straw and leaves provide the carbon source while the marc and manure make up the nitrogenous component. Our mix is roughly a 40:1 carbon to nitrogen ratio. 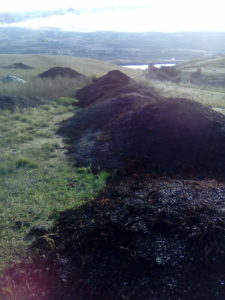 While the higher carbon content means a slower break-down of materials, a carbonaceous compost will favour a fungal population over bacterial one, which is what we are trying to achieve. 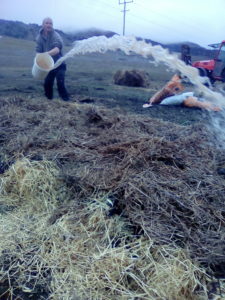 The lime was added to buffer the pH of the composting matter. We built three substantial piles to start, each approximately one meter high by one meter wide and twelve meters long. Their temperatures were monitored daily for three weeks while they heated up. Heat is a by-product of the aerobic decomposition process, and when maintained properly, that heat generated will kill weed seeds and other undesirable pathogens. We maintained ideal temperatures of 55 to 70 degrees Celsius for just over 15 days. Once the pasteurization phase was complete, the three piles were turned together into one massive heap. This year, we’ve taken another step forward with our compost by developing a system to capture the leachate produced during the process. Leachate is the nutrient-rich water loaded with beneficial microbes that has percolated through the compost. To achieve this, we cut a shallow v-shaped trench into a gently sloping hill. The trench was lined with heavy-duty plastic, then topped with wooden pallets to allow for drainage into a collection reservoir at the base. As a trial, one of the piles of compost was constructed on top of these pallets. 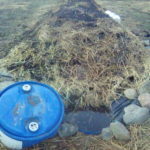 Initially the leachate was returned to the piles to aid in the breakdown process. Following the success of the trial, the three piles were combined and have been restacked on the palates to undergo the curing phase. Over the course of the next couple of months, we will collect the leachate and apply it back to the vines during the growing season. It’s a fun project, and I’m quite excited to see the return in the vineyard in terms of soil and vine health.